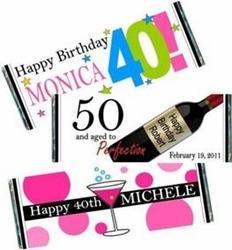 Trying to find just the right party favor for an adult birthday party? Chocolate is the way to go! Everyone loves chocolate! Treat your guests to a chocolate bar covered in one of our fun and festive Birthday Candy Bar Wrappers. We have a design for everyone! We can add a photo to your wrapper, or customize a one of a kind candy wrapper for your FREE! Adults love chocolate as much as kids do. Hand out these delicious chocolate bars and watch the smiles. You will enjoy handing them out almost as much as your guests will enjoy eating them. We can add a photo to any wrapper free! Just email us your photo to info@candyundercover.com We also do custom candy bar wrappers free of charge. Order the WRAPPERS ONLY. We provide the SILVER FOIL underlay and PERSONALIZED WRAPPERS! *This is for the do-it-yourselfer. We do NOT provide the Hershey candy bars!! *Our wrapper/foil combo will fit 1.55 oz "Regular" Size Hershey's® bars! *Assembly is required by customer *To sum it up: YOU buy the chocolate bars, YOU wrap the bars with silver foil provided then wrap with your adorable personalized wrapper. Order the fully WRAPPED CANDY BARS. We will do the work for you! Your Birthday favors will arrive to you all ready to hand out to your guests. If you would like to add a photo, please send image & order number to info@candyundercover.com.